First make the caramel ginger syrup. Melt the sugar in a medium (1.5 quart) saucepan over medium heat. Stir the sugar constantly until the color turn golden brown. Add the water and dissolve the sugar completely. Add the fresh ginger root. Turn the heat down to simmer and cook for about 15 minutes or until the liquid is cooked down to half the original amount. Drain the syrup and set aside to cool. Clean the saucepan then melt the butter in it. Put the flour into the butter and stir until well blended. Alternately pour the milk and the caramel ginger syrup into the flour and butter mixture, or roux, a little bit at a time to create a thick paste. Remove from the heat and add the minced crystallized ginger and egg yolks. Mix well and set aside. You can prepare the custard up to this stage and set aside until you’re ready to serve. Prepare the sauce by first simmering the wolfberries in the milk and sugar for about five minutes. Melt the white chocolate in the wolfberries milk while stirring constantly. When the chocolate is completely melted pour the sauce into a sauce bowl and set aside. 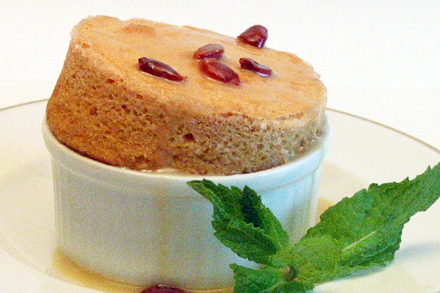 About half an hour before you’re ready to serve the soufflé. Preheat the oven to 350 degrees F. Whisk the egg white until it forms a firm peak. Fold about 1/4 cup of the egg white into the custard until well blended. Then fold the custard a little at a time back into the egg white. Grease six 3 1/2-inch ramekins with butter and coat with sugar. Fill the ramekins with the batter and place them on a baking sheet. 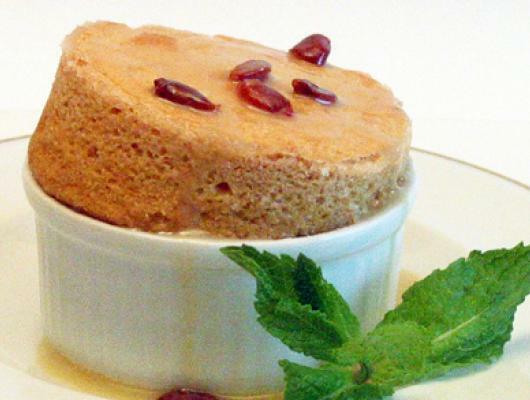 Bake in the oven for about 20 minutes and immediately serve the soufflé with the wolfberries white chocolate sauce.